I wrote the outline of this review all of five minutes after watching the episode, and I’m seriously struggling to remember a huge chunk of what happened. Barry and Ralph went looking for a... thing? Barry wore a necklace and all black and acted like a tough supervillain. Um... Cisco wasn’t in the episode again, that was a bummer. Iris should really invest in a cross-body purse for when her investigative journalism career leads her to break into the houses of suspected serial killers. Nora is being manipulative on top of lying to everyone around her, all because she trusts Eobard Thawne for reasons yet to be clarified. And that’s it. The rest of the episode is a hazy mess of confusion, which should make writing this review super fun! Okay, first off: the villain of the week is named Goldface. Gold. Face. There’s problem number one. Problem number two is they named the episode after that ludicrously named villain, a move I can only hope was done ironically. Yeah, yeah, I know Goldface is a pre-existing comic character, but that doesn’t mean I can’t find the guy’s name absolutely ridiculous. To its credit, the show does seem to lean into the silliness a bit — not with any explicit jokes or anything, but just by making the whole Goldface plotline as over-the-top as possible. It has undercover work! It has dramatic for-your-own-good betrayal! It has a mid-2000s sub-par action movie gunfight! Goldface is an arms dealer and general black market... negotiator? Mayor? I don’t really know what one calls a person who hosts a black market, but whatever that title is, Goldface has it. Barry and Ralph have to go undercover to get a piece of tech that will help Caitlin in creating her metahuman cure, but it take a lot of finagling and a lot of lying to gain the trust of the criminals at the market. Barry adopts the moniker “The Chemist” and claims a bunch of high-profile crimes as his doing, while Ralph, well, Ralph was already in a shifty sort of business before joining up with Team Flash, so he’s just playing himself. To add to the difficulty, everyone at the market gets cuffed with anti-meta cuffs. I don’t know how they got that technology since I’m pretty sure it was developed by Team Flash and only distributed to CCPD, but whatever. Hey, side note: if Team Flash could develop power-dampening cuffs and containment fields, why is finding a metahuman cure so difficult? Clearly, suppressing meta ability is not outside of their scope, so why is it such a struggle to adapt the same technology on an organic, vaccine-like level? Just wondering. Before Barry and Ralph can even get near the tech Caitlin wants, Goldface orders them to help his people steal a 3D printer from a hospital. I don’t remember why this 3D printer at the hospital is so special they have to steal it, but either way, it must be stolen. Barry is full of guilt over stealing from a hospital helping sick kids, so Ralph self-sacrifices his morals by locking Barry up and going to steal it alone. Except he doesn’t, because he has also caught the guilt. An action scene breaks out, complete with industrial metal music. All it was missing was some strobe effects. Nothing is stolen on this day! Barry and Ralph defeat Goldface and he melts but is somehow still alive, the hospital gets to keep their 3D printer (does it print body parts? I don’t feel like rewatching to find out, but let’s say it prints body parts), but Barry and Ralph have failed in their mission to steal that thing Caitlin needed. Ah, well. Can’t win ‘em all, kids. The B-story that should have been the A-story because it was a thousand times more tense and exciting than Barry and Ralph pretending to be gangsters: Iris being an investigative journalist and straight-up breaking into Cicada’s house. Well, I don’t think she knew it was Cicada’s house when she broke into it; she was under the impression that it still belonged to one of Orlin’s relatives, but Orlin surprised her by, like, living in it. 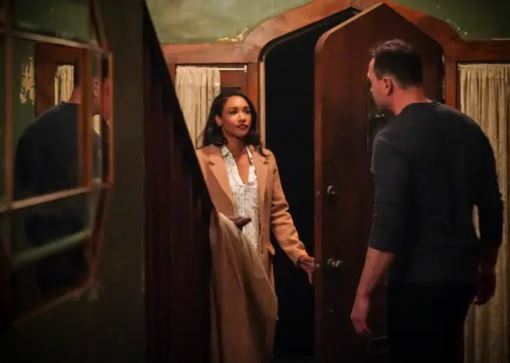 I know it would never be possible, but I think I could’ve been happy with a full thriller-inspired episode of Iris trying to sneak around Cicada’s house and, like the actual episode, trying to interview him when she gets caught. Which, yeah. She gets caught. First, when Orlin catches her at the door and she pretends to be investigating lead poisoning the water supply in his neighborhood, and then for realsies when Orlin notices she left her purse in the hall and didn’t have one when she was at the door. Iris, you really gotta leave your accessories at home while investigating. Iris, because she’s awesome, fights off Orlin and stabs him in his glowy Cicada-wound with what looks like a fancy pen? It’s genuinely difficult to tell. This encounter gives Iris an idea for defeating Cicada, but I really have no idea what her idea is. Using his blood, maybe? And the C-story of the episode is Nora trying to distract Sherloque from investigating her. She gets help from Eobard Thawne, who uses the excuse of wearing a Harrison Wells face (still not explained, by the way) to tell her he knows how to get into Sherloque’s head. I mean, the whole point of the multiverse Wells characters is that they’re all different so that makes zero sense, but fine. Thawne tells Nora she has to make Sherloque fall in love. Nora organizes a meet-cute with a woman Sherloque has already married in seven other universes. Sticking with the Sherlock Holmes theme, the woman’s last name is Adler (and I suppose my rant against romantic Holmes/Adler relationships would be too off topic for me to go into in a The Flash review, so we’ll just say this is a cute reference and move on). After some stumbles, Nora eventually succeeds in her goal. Sherloque is smitten and, after realizing that Renee Adler is a meta, pushes aside his Nora investigation to ensure she’s never targeted by Cicada. Eobard Thawne straight-up calls love a weakness and that raises no red flags for Nora? "Hey, anonymous criminal colleague." Ralph actually being funny is still weird to me. "Goldface, huh? More like Fool's Gold." It’s sad how serious Barry was when he said that line. Upcoming episode: “Next Tuesday, Next Tuesday, Next Tuesday” And by that I mean we’re going through a time loop!